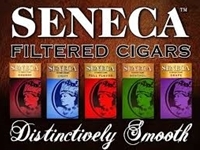 Seneca Natural Filtered Cigars come in 10 packs of 20 filtered cigars each. One of the best filtered cigars around, I think. Completely different taste from their original cigars,no longer have the sweet tips.